D.C. Bicycle Advisory Council: Does Cabi have staying power? Remember former Alaska Governor Sarah Palin? When she was selected by John McCain as his running mate in August of 2008 during his Presidential campaign, some said that her looks, the fact that she was a woman, her eye winks, her "momma grizzlies" and "you betchas", helped invigorate the McCain campaign and the Republican party. She was popular, and some have even said cool. However, according to a recent Gallop / USA Today poll as discussed by Jon Terbush of TPM, 38 percent of respondents said they viewed Palin favorably, while 53 percent said they viewed her unfavorably, which is the worse rating she has experienced since she arrived from Alaska. 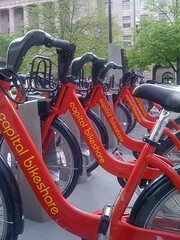 Currently, the region's Capital Bikeshare system (Cabi) is riding a wave of popularity. It's new, it's attractive and and most people like it. It fills a transportation gap that cars, Metro and walking couldn't completely fill. However, is that popularity based purely on how the bikes look, because is affordable or is it a substantive reason based on the view that Cabi as a better transportation alternative for short or medium distances trips? Once the notion of coolness ebbs, will people still use the system? After years of fits and starts, the District and it's neighbor are aggressively looking to bicycling as a viable transportation alternative to the automobile and even public transportation. In an article in the Atlantic by Kaid Benfield, Director of the Sustainable Communities and Smart Growth program at the Natural Resources Defense Council, he discusses how bicycling in the District is now cool thanks to Capital Bikeshare. "The popularity of the program is due to the attractiveness of the sturdy red bikes--every distinctive Capital Bikeshare vehicle on the street is a rolling advertisement for the program--and its incredible convenience. The system is very easy to use, and riders may pick up a bike at any station and drop it off at any station, perfect for short, one-way trips." That said, if the aesthetics of the Cabi system are one of the reason why it is now popular, what happens when the system gets old and more bikes are stolen? According to Eleanor Beardsley of NPR, the Paris bike sharing program had a serious problem with theft and vandalism. The program, Vélib, had approximately 16,000 of the total 20,000 bikes replaced due to vandalism or theft. Of that amount a total of 8,000 bikes were stolen. While reported thefts from the Cabi system have been very low, Wikipedia lists information about several bike sharing programs that have failed due to theft. Like other cities with bike sharing systems, some operators failed to account for the replacement of stolen or vandalized bikes, which leads to a lack of available bikes for use, which could lead to people viewing the system unfavorably. To look at a bike sharing system that did fail, we need only look at the District's own defunct Smartbike system. Under an agreement with Clear Channel communications and the District Department of Transportation, Smartbike opened in 2008 with fanfare and accolades. While theft did not appear to be a major cause for Smartbike's failure, Lydia DePillis of the Washington City Paper wrote that its demise was probably inevitable. Only two years after its introduction, a lack of advertising of the program, the selling of long-term membership only, and a limited number of bikes (only 120 bikes at 10 stations) hastened its end -- plus, and let's be honest, the bikes looked kinda blah. One of the basic reasons why bike sharing programs fail is because they do not reach enough people. The Vélib system in Paris is considered a success because people use it. People use it because its every where. This does not mean that Cabi should haphazardly open stations but it should have a plan that increases accessibility and connectivity to the system core. The Living Social deal dramatically increased the number of Cabi users is a few days. This put bike sharing in the consciousness of not only people in the area but people around the world. To continue reaching new customers, Cabi and the District government should work with businesses to adopt bike sharing as an alternative to maintaining vehicles to travel relatively short distances or relying on cab to move about the city. Cabi has a corporate sponsorship program that could greatly expand the system if they encourage businesses to purchase a bike station in exchange for advertising or branding bikes or stations. An important aspect missing from Cabi's introduction is reaching out to District communities. As the system expands, it needs to show the benefits of bike sharing. Bikes are not just for children but its a great way to get somewhere local quickly and relatively inexpensively. Advisory Neighborhood Commissions, civic associations and religious organizations can be a great way to demonstrate the effectiveness of the system. Further, a sustained effort by Cabi and DDOT could show people who live in currently under served areas that the system is also for them. Treat it like transportation and not a gimmick. In Paris, which has a well-developed public transportation system, Vélib complements it. Previous iterations of bike sharing systems seemed to treat bike sharing as a perpetual pilot, something that is here today but not in the long-term financial plan. The District, Arlington and future jurisdictional adopters should look at bike sharing just like roads or public transportation. The Cabi bikes are attractive, as Kaid Benfield said; however, eventually all things eventually fail. Since the system is still relatively new, it is unclear just how expensive it is to transport and service the bikes. If Cabi develops a reputation for poor maintenance or shabby-looking equipment, it could discourage use. Hopefully, Cabi is not just pretty-faced bike sharing system. While it needs to be attractive is also needs have substantive uses; it needs to remain practical and accessible for it to be ultimately successful. Cabi should not be seen as a passing fancy but also as a legitimate transportation alternative for everyone. DDOT should strive to work with local organizations so that they understand the system's health and environmental benefits and a vested in its success. If it succeeds in the District, it could mark a new chapter in bike sharing, one that doesn't end with the word "failed" or the phrase "former Governor of Alaska".